Sat, 7 May 2011 | Published in I Was There . 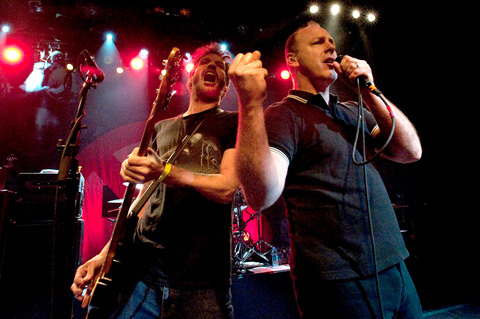 . .
On May 6th, Bad Religion and Rise Againstplayed at Terminal 5 as part of their sold-out tour together. It was unusual for Bad Religion, who is such an immensely influential and seasoned rock band, to only have a forty-minute set as the opening band that night, but they definitely took the high road by thanking Rise Against and playing a really solid set of songs from all different albums of their 30-year legacy. Amidst the discarded plastic beer cups everywhere at Terminal 5, there was plenty of space to thrust our fists into the air, but no one could do this as marvelously as renowned singer/songwriter/front-man Greg Graffin, or Dr. Graffin, as he was recently selected to teach Evolution at Cornell this upcoming fall. The good aspect of seeing Bad Religion as an opening act was that many fans of Rise Against, who wouldn’t normally see Bad Religion, got some good exposure to them. Following Bad Religion, the Rise Against performance was tight, well put together, and very high energy. As a result, the entire show was highly enjoyable.